Mary: I am showing my age with this one. I had never heard of these guys and I couldn’t begin to tell you one of their hits. (Truth: I thought one of these guys ended up on Antiques Roadshow) However, I do know that someone who was teen/pre-teen in 1990 is now…wait for it…. late 30s. Ouch. Think this still belongs in a youth biography section? Holly: You’d never heard of NKOTB?? What planet did you live on in the late-80s/early-90s? I mean, you seriously needed to be somewhere other than Earth to not have HEARD of them. They were everywhere. Yeah – I’m in my late 30s and I was about 14 when NKOTB was at their peak. I wasn’t a fan, being the metal head I am (and was), but every girl I knew had NKOTB lunch boxes and folders and posters and t-shirts and whatever else there was. It was the Bieber-Fever of the time. Even though they had a reunion tour in 2011 with the Backstreet Boys, I’d weed this book. 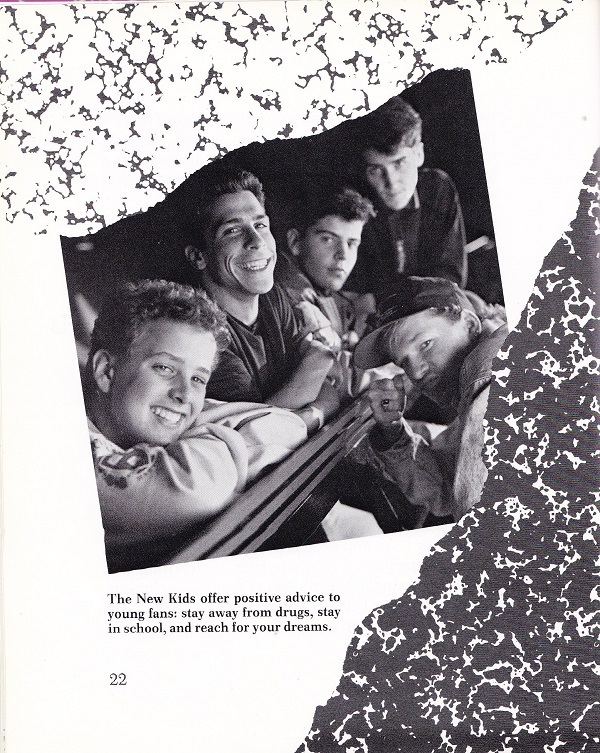 It is a youth book, and today’s youth are not NKOTB’s fans. My age group is, so you need something for adults. Consider buying the new one being published in October 2012 called “New Kids on the Block: The Story of Five Brothers and a Million Sisters” by Nikki Van Noy. Please tell me the middle guy isn’t Brian Batt who played Salvatore Romano the art director on Mad Men. There’s a strong resemblence. Haha I was given that book when I was 8! I loooathed them and gave it to my friend. I saw it in my elementary school’s library about 5 years ago when I went back and volunteered and thought that was likely a dumb book to have kept then! Donnie Wahlberg is on the CBS show Blue Bloods. Definitely not Bryan, I was in the grad theatre program at Tulane when he was there as an undergrad. Definitely too much of a N’awlins boy to have been from Boston. That book looks frighteningly familiar, like my sister or a friend owned it at one point. Back row: Joe, Danny, Jordan. Front Row: Jonathan, Donnie. No Brian Batt. I haven’t seen anyone wear a shirt with their own photo on it since Pall Rudd in 40-year old Virgin. 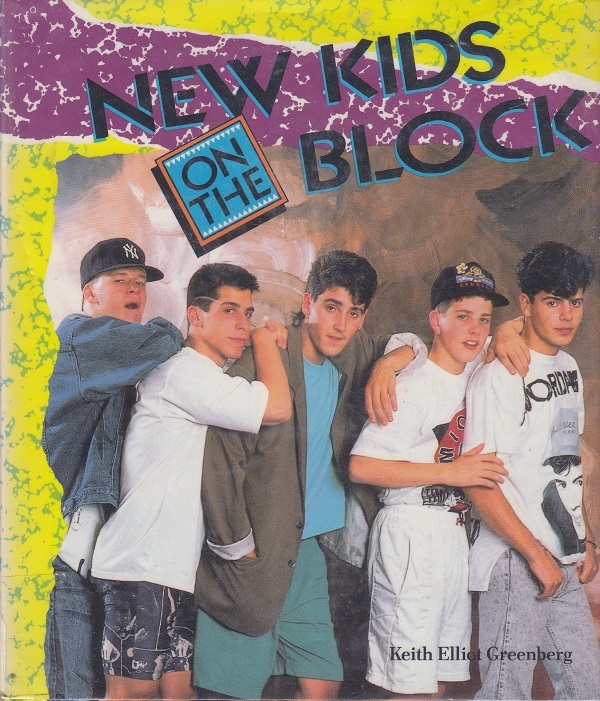 I was in 5th grade when NKOTB was big – we had a club and yes, I owned this book. Good times, good times. I was about 4 when these guys were popular, but I loved NKOTB!! I actually saw them a couple years ago during their first reunion tour & it was a lot of fun. I was in elementary school when NKOTB were big. My parents thought it was inappropriate for elementary me to drool over high school boys (not that I was really tempted, since I was just past the cootie stage anyway), so I was the last to know about them in the neighborhood and was therefore stuck forcing to like the “ugly” one – don’t ask me now who that was supposed to be – and as a result I secretly loathed them, although their music and probably this book as well were inescapable at slumber parties, etc. The funny part in college was when a dormmate pulled out an old cassette where one mentioned attending our same school. Of course, current students would have no idea who he was – or of the crazy musical past of the Wahlberg brothers. I was ten when this book came out. Even though I always had this extreme loathesome annoyance for that “musical” group. I was in my twenties and male when they were popular, so I had no interest, but I was aware of them. 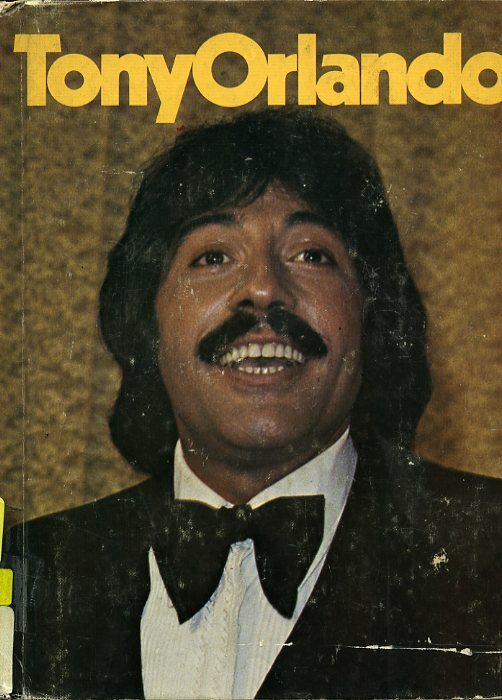 I think the brother of one of them was in Boogie Nights. Donnie Wahlberg’s brother is Mark Wahlberg, who was in The Fighter and Boogie Nights. I had the biggest crush on Jordan in elementary school. I thought his rat tail was so hunky! I didn’t have this book, but I did have the Jordan Barbie. Who actually cares about NKOTB, either in 1990 or today? We’re both in our early 30s now, btw. Yeah, give this book the boot or to someone who will give it a good home. I remember having a NKOTB birthday party when I was in second or third grade, which I think consisted of having a dance party to their tapes and giving away these massive buttons (I’m talking as big as your head) as party favors. I cringe now when I think of it, but at the time I thought it was the best party ever. I may laugh and roll my eyes at my eight-year-old niece’s devotion to Justin Bieber, but I guess I wasn’t too much better when I was her age. Just don’t tell her that. Yeah, I had a poster of Joe back in the day. 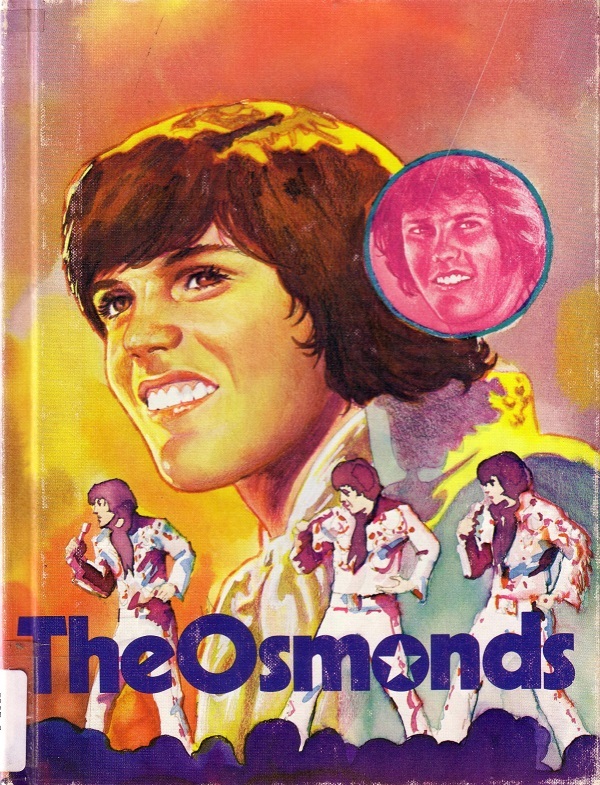 I still own this book! For nostalgic purposes of course. Same reason I still have a NKOTB pillowcase. If nothing else, they’ll be good to show my children if they become obsessed with the poplet-of-the-day. Still, doesn’t belong in a public library. OMG, I got this book from a book order when I was in 4th grade! I remember choosing it because my friends were into them and I thought I should be too. LOL about Jordan wearing a shirt with his own photo on it! Glad somebody else caught that. 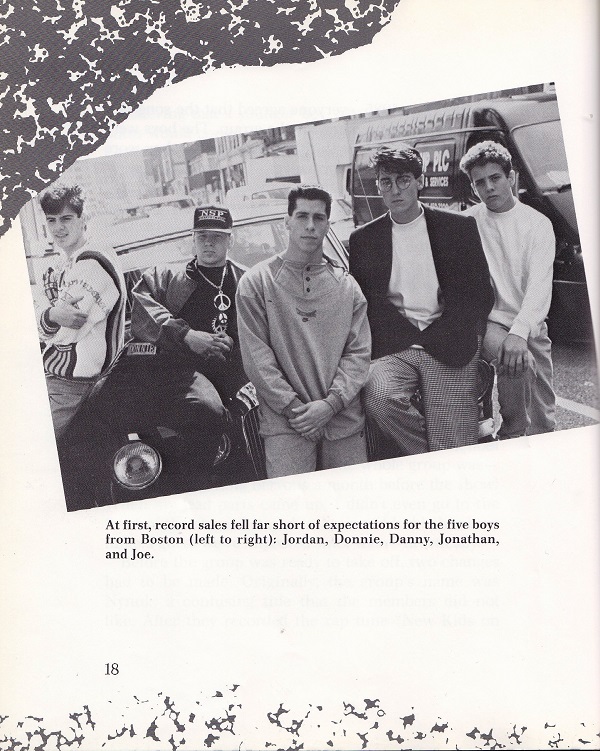 I grew up in Mass,(outside of Boston) and NKOTB was a big deal to me and all the other pre-teen girls in town. Joey was my favorite! I don’t quite understand the NKOTB/BSB collaboration thing. NKOTB was popular a good decade before Backstreet Boys. They didn’t exactly share a fan base. Heck, I was a huge Backstreet Boys fan in elementary school, and even I’m finishing up college now. Neither band has a youth fan base anymore. Even the youngest NKOTB fans are at least 25 by now. 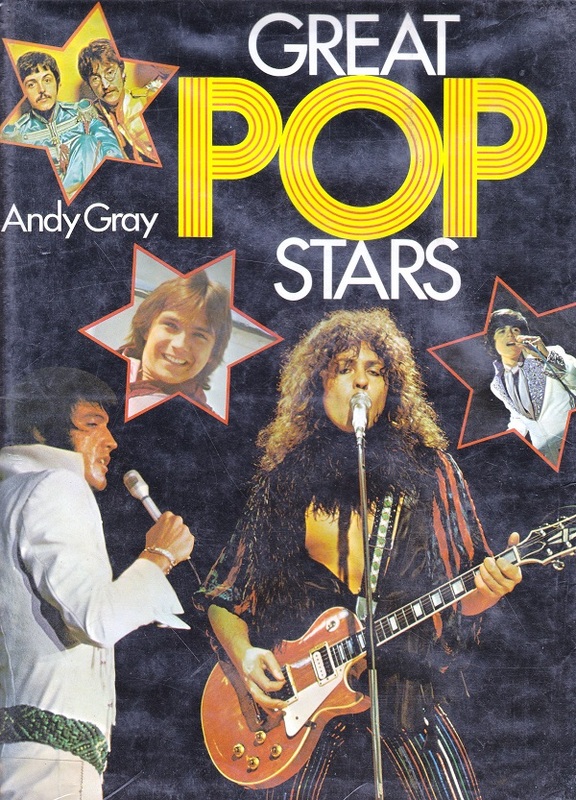 That said, I’m sure a lot of people would love to have this book for nostalgia purposes–if they don’t already.